Breakfast and WIFI are free of charge at the ibis Styles Trier hotel. These complimentary services are available at all ibis Styles hotels. 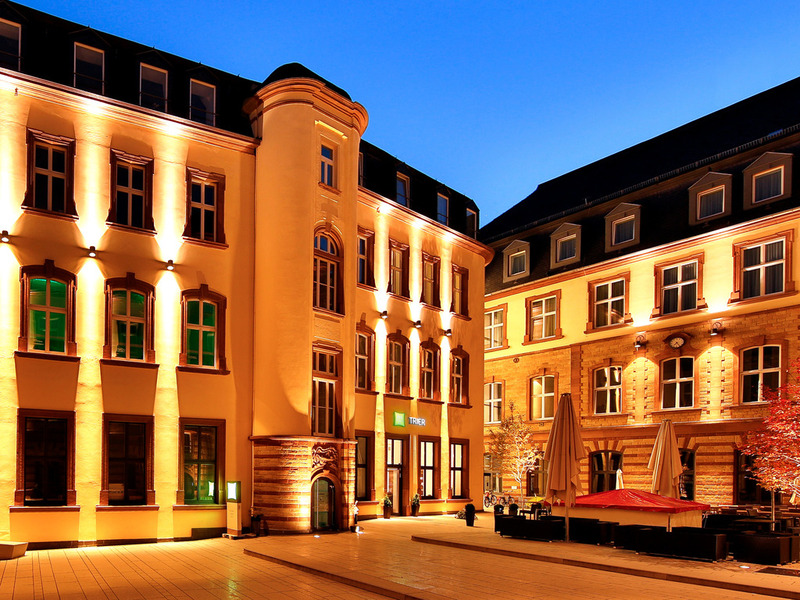 The hotel is built within the historical buildings of the old post office and is just a few hundred meters from the famous Porta Nigra. Some of the rooms have a ceiling height of more than 4.9 yd (4.5 m), which offers a unique and spacious feeling. As well as the numerous complimentary services available at ibis Styles hotels, guests can also enjoy the fitness room. The modern rooms feature a unique design that creatively reflects the Roman past and historic architecture of the building. Ceiling heights of up to 14.8 ft (4.5 m) and comfortable Sweetbed by ibis Styles beds guarantee the highest levels of comfort. We are happy to provide you with a baby monitor and night light, available free of charge on request. Good sized and clean room. Great and clean bathroom. Ample breakfast opportunities on the 1st floor. Friendly service. The staff were nice, they always greet me whenever I enter the reception area. Even though it was just for one night, this hotel surpassed others we had stayed at due to the great design of the room, central location, great beds and good breakfast. Will be happy to recommend this and if we visit Trier again we know where we are staying! Everything was so to speak ok - BUT, i was really annoyed, that we every morning had to stand waiting until the door was opened into the breakfast area. Your staff was late 3-8 minutes every day according to, that you stated to open at 630. Dear BENT A., We very much appreciate your comments regarding your stay at the ibis Styles Trier. It is always a pleasure to receive positive feedback. I will share your comments with our team. I am sure that this feedback will serve as an encouragement to all of our staff as we strive to continuously improve the quality of our services. Thank you again for sharing your experience, and we hope your next visit will be as pleasant as the previous one. Sincerely, your ibis Styles Hotel Trier, Natascha Blasius, Reservation Department. Dear NANCY, We very much appreciate your comments regarding your stay at the ibis Styles Trier. It is always a pleasure to receive positive feedback. I will share your comments with our team. I am sure that this feedback will serve as an encouragement to all of our staff as we strive to continuously improve the quality of our services. Thank you again for sharing your experience, and we hope your next visit will be as pleasant as the previous one. Sincerely, Your ibis Styles Hotel Trier, Natascha Blasius, Reservation Department. Smell of dead ratfrom sink Lose shower Not so quiet Late breakfast Your parking lot is a joke with not well visible signs and unfriendly reception! Very pleasant stay an interestingly decorated hotel. The stone effect walls and floors are very good together with the roman pictures and other information. From beginning to end very professional. Appreciated the room upgrade also. Nice location, very cleaning rooms, excellent breakfast and kindly staff. The hotel is situated right in the middle of town. It’s close to shops, restaurants, and bars. It’s very clean, and the breakfast is outstanding. Would be nice to have a coffee and tea commode on every floor. We came by car and it was a pity that we could not park the car anymore. There is room for approximately 15 cars. We had a room in a different building, and it was quite clear this was the less convenient section. There was no tea- or coffee commode for some drinks, and not even a drawing machine for some extra drinks. I didn't expect to get a lot of luxuries, but it's quite plain basic to offer a vending machine to get some drinks like water or soft drinks. Right in the center of the tourist area with plenty to see and do just meters away from the hotel. Staff were excellent, i would recommend this hotel to anyone. This was the perfect hotel for us! We loved the cleanliness and efficiency of this hotel. The room was fantastic--small but with everything we needed...very clean with great wall art and high ceilings. We very much appreciated the awesome breakfast; it was very satisfying and much more than we expected. The location could not be beat. The courtyard with the potted olive bonsai trees made us feel like we were in a special place as we came and went. We were there for two nights over New Year's Eve and, at the spur of the moment, even signed up and ran the annual Silvesterlauf run (5K for women, 8K for men), and it was all so convenient to walk to everything we wanted to see! Thank you for a wonderful experience! Quiet location in the middle of old town center Trier. Step out of the hotel and you are in the middle of the carfree zone and city center. We had a comfort twin room , very quiet even with the window wide open. Good bedding although l cannot stand the plastic matras protection under the sheet. I forgot to take it away and woke up several times because l was transpirating. That is 2 points less. Very good breakfast included, enough space even in the 09.30 hrs rushhour. Very kindcand helpful staff. Parking was not available when we arrived but there are many covered parkings very nearby and you can unload and load in front of the hotel. If you are not sensitive to a plastic matras protection then l would give this hotel 10 points. Of course you can also take it away. Stayed here last weekend, and it was magic. Smooth check in and friendly front of house staff. Room was very comfortable and bed and pillows good quality. Perfect location for shopping or sight seeing. Great tea, coffee & water in reception area. We ate each night in the restaurant across the courtyard be sure to try:) The breakfast is good only downfall is we only had bacon on the morning we were leaving. the bacon was lovely, and unfortunately it was the best breakfast we had during our stay. Sausages were not great:( We were so happy they start breakfast at 6:30 it was good to fill up before heading to the airport. We want to thank all the staff from start to finish. Great hotel, we would be happy to come back, and would happily recommend to others. Dear Babybellkerry, thanks for the great feedback and that you found the time to share this with us. We are pleased that you enjoyed your stay with us and we were able to convince you of our design and our service. Your praise, we will pass on to all our employees, because only they make it possible our vision to inspire people to meet. It would be great to welcome you back someday in our beautiful city. Your ibis Styles Hotel Trier, Natascha Blasius, Reservation Department. superb location in center town, hotel parking at Trier is a must, very nice hotel concept, spacy and clean room, very friendly staff, very good breakfast, only positive experience all over the line and with the Osteria near the hotel, what can we expect more than to be relaxed. Old building, completely refurbished. High quality and beautiful accommodations! Old and historic building, completely refurbished, located at heart of Trier, near of main stores, restaurants and bars. Accommodations with high quality and beautiful local/historical decoration. Breakfast could have more quality and variety.